Boston came in 15-0-4 in its last 19 games for the franchise's longest point streak since 1940-41. A goal by John Moore with just over a minute to go got Boston within one, but McCann's empty-netter with 21 seconds left made the Bruins regulation losers for the first time since Jan. 19 against the New York Rangers. "I think we can be proud of that, but not satisfied," Moore said. "There's no reason we can't get back to work on Tuesday. That's the special part about this group. Guys really push each other. We expect a lot out of each other." McCann's two goals — a short-handed breakaway in the first and his flip from near center ice in the waning seconds — gave him 16 goals on the season, eight of them coming in his 19 games with Pittsburgh. Bjugstad added his fifth with Pittsburgh, matching the total he put up in 32 games with Florida. "They're two real good players and they've embraced the roles we put them in," Penguins coach Mike Sullivan said. David Krejci picked up his 19th for the Bruins and Jaroslav Halak made 33 stops, but Boston was on its heels for most of the first period while falling into a two-goal deficit from which it couldn't recover. "We were light on all the battles in the first," coach Bruce Cassidy said. "You could tell they were better prepared to win the pucks. It cost us a couple of goals." The Bruins used the franchise's longest point streak in nearly eight decades to rise above the muddled portion of the Eastern Conference playoff race. Their six-week stretch included flashes of dominance and a flair for the dramatic. Boston arrived in Pittsburgh coming off a 6-0 homestand, one that culminated with last-minute victories over Florida and Ottawa. 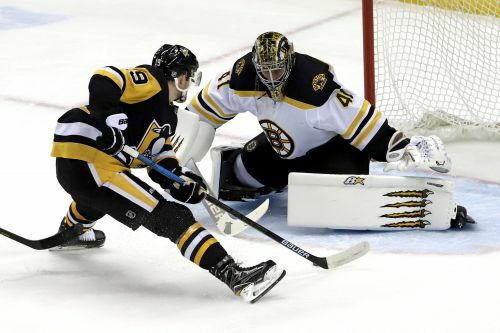 Boston's run came to an end against a team that seems to be gaining some momentum late in a bumpy and wildly uneven season, at least by Pittsburgh standards. Things appear to be evening out thanks in large part to Bjugstad and McCann's fresh legs. "I feel like the harder you kind of fake it the more he has to respect it," McCann said. "I just try to fake it as hard as I could and he bit on it." Pittsburgh's potent power play has been a bit of a mess of late — just as likely to give up a goal as score one — and was a lifeless 0 for 4 when Sullivan put Guentzel on the top unit with Sidney Crosby. It paid immediate dividends. NOTES: Boston D Matt Grzelcyk left in the second period after his right arm was pinned awkwardly against the boards when he got hit by Pittsburgh F Patric Hornqvist. Cassidy said X-rays on Grzelcyk's arm were negative ... Both teams went 1 for 5 on the power play. ... Pittsburgh C Evgeni Malkin did not score and remains two points shy of 1,000 for his career. ... Aston-Reese exited with a lower-body injury.